How many couples have put off their plans of having a wedding ceremony because of financial limitations? It's not an uncommon sight in the Philippines, don't you think. My househelper says that it's the usual practice in their province to be kasal sa banig (married in bed/sleeping mat). The sad truth, really, is that food, clothing, and shelter are immediate priorities and having a wedding ceremony would just be a big expense. This is the reason why KMBI provides annual mass weddings to selected couples throughout its 71 branches scattered around the country. KMBI, or Kabalikat para sa Maunlad na Buhay, is a non-government organization that helps finance microentrepreneurs located in their 71 branches scattered around the country. Aside from the eradication of poverty, their programs aim for holistic transformation which is the reason behind the mass wedding project. Even with the rains and the floods brough about by Typhoon Falcon, the simultaneous mass ecumenical wedding ceremonies were held last June 25, 2011 in KMBI's 65 branches nationwide. 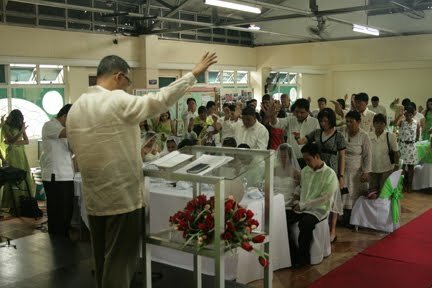 A total of 563 couples braved the stormy weather and exchanged vows. The ecumenical mass weddings gave couples of different spiritual backgrounds the opportunity to be joined as one. This is one of the organization’s major activities that are being taken cared of by their Transformation Department. It aims to reach one of the components of its SEES (Spiritual, Economic, Environmental, Social) program, which is to draw people near to God and have a deeper relationship with Him. 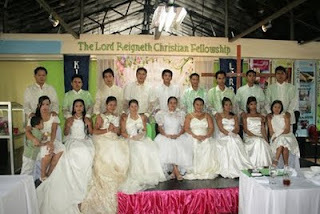 For more information about KMBI and their programs, you can visit www.kmbi.org.ph.